Today I was quite shocked to find not one, but two unexpected packages containing delicious candy treats. One was from Jelly Belly (look for that review coming soon) and the other was from our friends at Licorice International (who, by the way, have a beautiful new site). Intrigued, I ripped open the box to see what treasures it might contain. Inside I found two packages of Australian Waldov Liquorice, one raspberry flavored and one black, as well as two “Irish Potatoes” and a nice note informing me that these were newly stocked items. Well, I’m always up for a new kind of licorice to try, so I immediately tore open the black licorice bag. I could smell the delicious scent of black licorice even before the bag was fully open. Gingerly pulling out a piece from the bag, I noted that they were sticky but soooooo soft. I’m talking butter soft here, people. No, seriously, softer than you’re imagining. Firm enough to hold their shape, but just barely. These are arguably the softest licorice bits I’ve ever tried. In my book, that’s a good thing. The flavor was also superb. The ingredients include molasses (which I think lends a wonderful taste to licorice), liquorice extract (that’s the good expensive stuff), and a couple of other things, all of which are natural. There was a very mild saltiness to offset the sweet, but still a good, strong licorice flavor. Yum yum yum! After tearing myself away from the black, I turned to the red. How would it stack up? In my experience, it’s often a bit harder to chew than its black brethren. I first noticed that it was just as sticky as the black, which seemed to bode well. My first bite proved that it was just as soft as well. The flavor was definitely raspberry, and I’d say it’s probably more true to an actual raspberry than a lot of other “red” licorice. It was fruity and tart; where the saltiness in the black set off the sweet, here the tart served the same purpose. Between the two, I’d definitely go for the black, but if you’re a fan of raspberry flavor, you definitely won’t miss with the red. On to the last little occupant of the box: Oh Ryan’s Irish Potatoes. When I first dumped out the contents of the box, I didn’t know what the heck these things were. I mean, let’s face it, they don’t look exactly appetizing, do they? In fact, they look a lot like… well, use your imagination. I quickly Googled the term and came up with a site that had a recipe for Irish Potato Candy. Aha! So that’s what these things are. Time to taste. I was a little apprehensive at first because I noticed that they were basically just buttercream, coconut, and sugar rolled in cinnamon. I don’t particularly like coconut or cinnamon, so I figured I wouldn’t like these. But always willing to up my blood sugar just a little bit more, I took a tentative bite. Surprisingly, I didn’t hate them! In fact, I actually liked them! The cinnamon coating is tempered beautifully by the sweet interior, and while the coconut is noticeable, it isn’t overpowering. Everything seems to be in perfect proportion in these deceivingly ugly little morsels. And hey, it’s a great way to bring some candy goodness to St. Patrick’s Day! Get 10% off your entire order in March using this code at checkout: MAR10. Seriously, do it! The licorice is the best. They also sell the same licorice coated with chocolate. It sounded gross til I tried it. your fan preferred the old site and wishes you made it like it used to be. Thanks for reading, and rest assured this will not prevent me from reading the blog anyway! i agree with trish. i loved your old site, and it was much more fun to look at than his. this version is also harder to navigate, as trish also pointed out. i hope this is just a temporary layout and the candy addict i know and love will be alive and kicking again soon. i still wont stop reading your blog though!! I agree that I will probably not be coming to this site any more.. It is very hard to read and very bland looking with the grey color scheme. It appears very amateur and out-dated. The face that only two articles are available per page makes it even more worthless to try and keep clicking the “Newer Posts” link to keep going back.. I think I’ll stick with CandyBlog… Sorry guys !!! It was fun and tasty while it lasted.. I love this site, and I can’t FOR any reason other than a layout why you would leave, sweet toof. What matters is the Journalism and the core subject of this site: Candy. I will come here for the fantastic writing and dead-on accurate reviews no matter what the site looks like (okay, I draw the line at neon-yellow text and seizure inducing flashing lights on every page, but you know what I mean :P). Though I am in no way affiliated with this site (unless they’re hiring again, and if so… ME!! ME!!! OVER HERE! ME!!!!!!! :P) I would place a large wager on the fact that this is temporary. Brian mentioned medical issues and combined with server/hosting switching etc., I’m guessing this is just a ‘for now’ thing. And as far as articles, they have always been steady at an article a day or more sometimes even, so again I’m 99% positive that this is something temporary and they’ll be back in the swing of things VERY soon with tons of articles that have been backlogging since the whole ‘mess’ started. But on the subject of candy, I love black licorice and will have to try these! The potatoes sound pretty fantastic too, I’d never heard of them either. Thanks for the great review! Yep, it’s still being worked on. As with any other technology, nothing ever goes smoothly. Unfortunately, you can’t just go and smack around a server to make it work, so it’s taking a little (lot) longer than we expected to get the site fully functional again. Until then, we’re going to be publishing on a much lighter schedule and you may see more changes to the theme until we can finally get the tried-and-true theme back up again. Thanks for the review of our licorice! The Australian licorice and strawberry twists are two of our top-selling products. 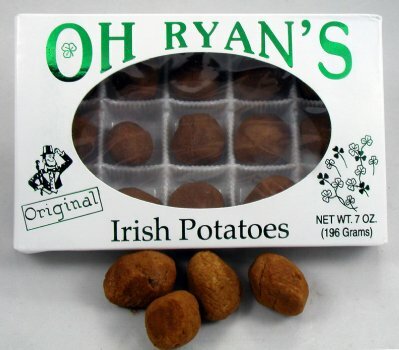 Oh Ryan’s Irish Potatoes are a wonderful treat that we stock from late January through St. Patrick’s day–don’t miss out!! Visit our website for a selection of the world’s best licorice. Over 160 varieties in stock!